Meg Mims may have been born in the wrong century. Her love of historical fiction started early, with visits to Michigan’s Greenfield Village and the Streets of Old Detroit at a museum. She was first published in children's magazines, is a staff writer for a real estate business and for Lake Effect Living, a West Coast of Michigan on-line magazine, and is also a watercolor artist and photographer. From a young age, she had a taste for classics such as Jane Eyre and Gone With The Wind, books by A. C. Doyle and Agatha Christie, along with J.R.R. Tolkien and Ursula LeGuin. Now Meg devours historical, cozy and PI mysteries. Her award-winning fiction always has a dead body or two, plus an independent-minded heroine and a sense of justice being served in the end. She lives with her husband, a drooling black cat and a make-my-day Maltese-Poodle, and enjoys games and visits with family and friends far more than housework. August, 1869: Lily Granville is stunned by her father’s murder. Only one other person knows about a valuable California gold mine deed--both are now missing. Lily heads west on the newly opened transcontinental railroad, determined to track the killer. She soon realizes she is no longer the hunter but the prey. The last thing Lacey Gordon — divorced with a teen daughter and two cats — needs is a rescue dog coming into her life. To top it off, she’s rooked into a “Get Under the Mistletoe by Christmas Eve” dating contest. 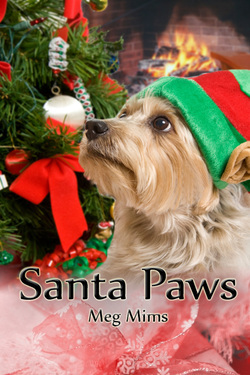 Since Buddy the dog prefers to be the only “new guy” in Lacey’s life, will Santa Claws ruin her holiday for good?